I remember the first time I ate tacos. It was in the ‘70s, and my mom bought a box of hard U-shaped corn tortillas that she and I diligently filled with spicy ground beef, shredded lettuce, diced tomatoes, and salsa. I thought they were perfect. That is, until I tried to eat one. I opened wide, took a big bite out of one end, and the shell cracked in half. Panicked, I tried to hold it together with two hands, but the pressure of my fingers made it crack more. Tiny pebbles of ground beef littered my plate, salsa splashed my shirt, and shredded lettuce tumbled to the ground. It was awful. I was a taco failure. It wasn’t until years later, that I discovered soft taco shells. Soft? Weren’t all taco shells hard? Didn’t they all splinter in your mouth when you bit into them? Blissfully, no. I have never gone back to the hard shells since. But I have gone back to this recipe, and I hope you will too. These Southwest Roasted Yam and Caramelized Onion Tacos drizzled with PHILADELPHIA Santa Fe Blend COOKING CREME are addictive. 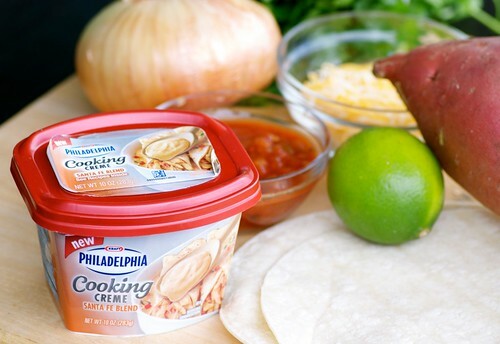 The Cooking Creme is a spoonable, easily meltable cream cheese seasoned with Mexican herbs and spices. It’s ideal for nachos, pizzas, eggs, and, of course, tacos. My recipe for Southwest Roasted Yam and Caramelized Onion Tacos is part of a collection of blogger's recipes you can find at The Real Women of Philadelphia web site. That’s where Paula Deen and PHILADELPHIA CREAM CHEESE have joined forces to find their next big cooking star. The finalists have been chosen, and the winner will be announced at The Live Event at the historic Lucas Theatre in downtown Savannah, Georgia on June 30th (visit the site for more details). The event will be live streaming from 8pm EST and 5pm PST. The winners will contribute to a cookbook, star in cooking videos, make publicity appearances, and become $25,000 richer! Want to find more great recipes like this one? Go to the Real Women of Philadelphia site and check out the finalists’ recipes. There are some great ones there -- then come back here and tell me which one(s) you liked most or want to try. I’m always looking for new ideas! 1. Preheat oven to 400 degrees. Line a large baking sheet with parchment paper or aluminum foil. 2. In a large bowl, toss dices yams with 1 tablespoons olive oil and a sprinkling of salt and black pepper. Place in the center of the oven and cook for 25 to 30 minutes, or until lightly browned and tender when pierced with a knife. 3. Meanwhile, in a large skillet over medium-high heat, warm 2 tablespoons olive oil. Add onions. Saute for 2 to 3 minutes, then reduce to a simmer. Cook onions, stirring occasionally, for 25 to 30 minutes, until soft and caramelized. Add potatoes to the pan and toss. 4. To assemble, place a warm tortilla on a plate. Fill the center with the potato and onion mixture, and top with 1 to 2 spoonsfuls of salsa. Drizzle with 1 to 2 spoonfuls of Phildelphia Santa Fe Blend Cooking Creme. Garnish with a couple of sprigs of fresh cilantro, some shredded Cheddar cheese, and serve with a lime wedge. To check out more wonderful blogger's recipes, visit the BlogHer Round-Up page! That is exactly how I remember tacos back in the day. ;) So glad I've discovered all the wonderful alternatives like this one. It's so nice to know I'm not the only one who has serious issues with hard tacos! I love the veg stuffing in these...something I could totally see myself having for dinner! I read your first sentence and tried to remember the first time I had tacos...and can't! But, I am sure it was my grandma's tacos - she fries the corn tortillas herself and then bakes them - the perfect balance of crispy and soft. These look like they might be good with black beans, too. I prefer soft tacos too. Those fillings looks delicious. It has been a while I cooked anything with yam! This is great! Gonna this this out this weekend! I've never seen a taco recipe that didn't call for some type or meat or fish, and I'm surprisingly still interested :) I love yams and onions. I'd try adding some avocados in there (they go with everything, don't they?). Thanks for sharing - lovely recipe! Mmm, I love just about anything with carmelized onions!!! Looks like the perfect combo of ingredients! Beautiful picture. I have seen those philly crm cheese tubs at the store and thought "genious!" Cant wait to try it out! med-Your grandma's tacos sound like perfection. You were lucky! I don't think my grandmother ever ate a taco. She was too busy making pasta, meatballs, and pizzelle cookies! FGF-I hope you do! I just love them. amee- Thanks! The cooking creme is really quite delicious. Flavorful but not overly spicy. 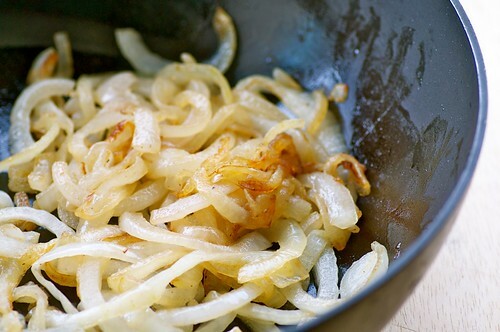 Yams and caramelized onions together makes most any dish a good one! I'm glad I found you on BlogHer. 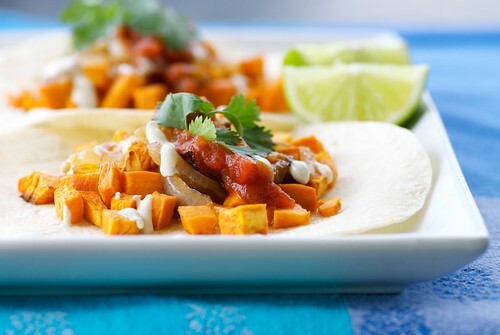 I love the idea of using sweet potatoes and caramelized onions in a taco! lana-Well, if that's his preference, what can ya do, right? I love the idea of making homemade ones though, especially with little helping hands! I have to say that even my carnivorous husband was completely satisfied with these veggie tacos, so I hope you give them a try.